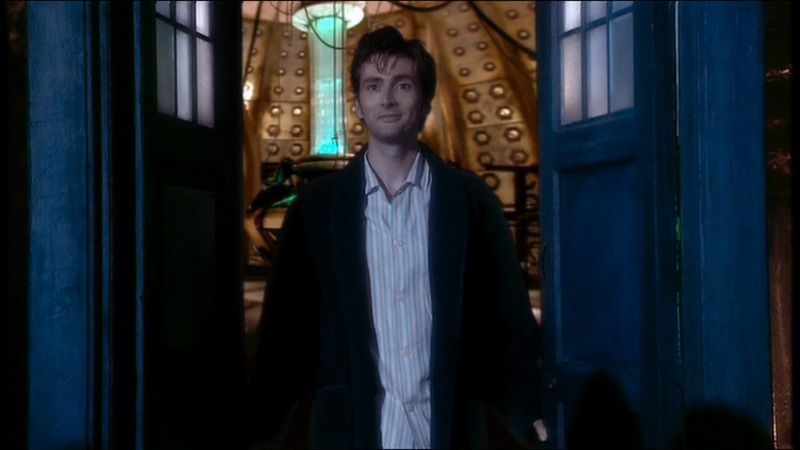 It seems odd watching David Tennant again after all this time. I don't think I've re-watched much of his stuff since it was originally shown. I wouldn't read too much into that. I don't tend to re-watch New Doctor Who as much as I do the old stuff. I admit I am more comfortable with Classic Doctor Who, which is partly due to nostalgia and partly because I like a good cliff-hanger. But there was something I didn't quite like about this story and I think it is summed up by the final scenes of the Doctor and Rose flirting whilst the ashes of the dead fall all around them. Yes, perhaps I'm taking this a bit too seriously, but it seems un-Doctor-ish, even if it is batted away by a little aside from Rose. It's all very well changing the dynamic of Doctor and companion but really there's a time and a place for everything. The dynamic between the Doctor and Rose is changing. There's lots of moody glances (in both directions) and with the new Doctor being much ‘busier’ than the old it already feels a little exclusive. Poor old Mickey gets to be a shoulder for Rose to cry on until the Doctor is up and running again. Then she's ready to dump them all and head off into the stars. Perhaps I'm being unfair based on a single Christmas special episode, especially one where Tennant doesn't really get into the swing of things until very late. After all he spends most of this episode asleep recovering from his regeneration. Popping up in the final act giving it large and talking. And talking. So much talking and so fast. It's like someone's recorded his dialogue on too fast a speed. He's funny though, I'll give him that and, as when he walks away from the falling Sycorax with the words 'No Second Chances', pretty good at the dark stuff. Based on the little we get to see of Tennant's Doctor perhaps his incarnation is going to be Tigger to Eccleston's Eeyore (if that's not a bit unfair on Eccleston). The Sycorax and their blood science are potentially rather interesting but are soon dropped in to the sub-category of 'Shouty'. There are hints at an interesting culture but in the end, someone’s got to be the bad guys and after a couple of gratuitous deaths, to establish their bad guy credentials properly. More interesting is Harriet Jones. Penelope Wilton is back and doing a fine job. However, Harriet's choices are perhaps more interesting than anyone else’s. Her decision to destroy the Sycorax ship, even though it is leaving angers the Doctor. He calls humans 'monsters', which is a rather changed tune than usual and decides to bring Harriet Jones's government down on a whim. It reminded me of the Doctor's reaction to the Brigadier blowing up the Silurian caves in 'The Silurians'. Harriet's arguments make sense (even if they aren't pleasant.) The Doctor ignores them and takes it upon himself to end her government. I'm not sure that's a particularly Doctor-ish thing to do but then he's just amid a regeneration so who knows how those synapses are working. There should have been another way. The 'pilot fish' killer Santa’s and Christmas Tree seems a tad tacked on, but it gives us a threat to the comatose Doctor, which helps pass the time.